Those wanting to learn the legacy of Cooktown’s namesake will find everything they need and more at the James Cook Museum, devoted to preserving the town’s rich history and heritage. 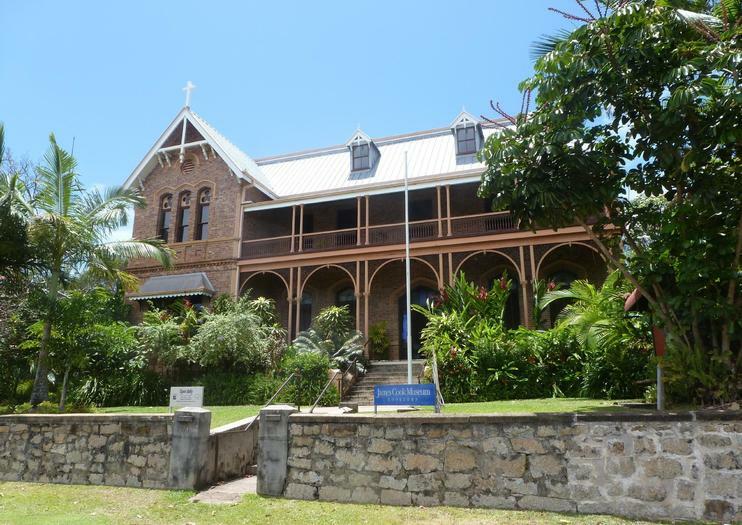 Housed in the painstakingly restored 19th-century Sisters of Mercy convent building, the museum tells the story of how Cook and his 86-strong crew spent 48 days marooned on the Northern Queensland shore in 1770, as they repaired their ship, the HMS Endeavour. Exhibitions detail the fateful events of Cook’s stay, including the repairing of the Endeavour, the early encounters between the British explorers and Australian Aboriginals, and the first sightings of native Australian animals like kangaroos and dingos. Additional galleries cover Cooktown’s history, from the heritage of the indigenous Guugu Yimithiir people to the 19th century Palmer River gold rush, and the role of Chinese immigrants. Highlights include the Endeavour’s original anchor and cannon, and a series of personal stories and artifacts from local families, as well as a terrace café and gift shop. The James Cook Museum is located on Helen Street in Cooktown, North Queensland and is open daily April to Oct from 9am-4pm; Nov to Jan and March from 9.30am to 4pm; and Feb from 10am-1pm. Admission is AU$10 for adults, AU$3 for children. Enjoy a spectacular journey that is just as pleasurable as the destination: the historic township of Cooktown, home of Australia's first European settlement. Travel by 4WD through the UNESCO World Heritage–listed Daintree National Park and the Bloomfield Track, two highlights of northern Queensland. Venture into the rainforest and cross the Daintree River before reaching Cooktown, where you have free time to visit the James Cook Museum (optional). Includes round-trip transport by 4WD and an optional flight for hotels in Cairns, the Northern Beaches and Port Douglas. Take in the highlights of Northern Queensland on a 2-day 4WD adventure from Cairns, including overnight accommodation. Drive the scenic Captain Cook Highway and explore the UNESCO-listed landscapes of the Daintree National park, stopping to spot wildlife in rainforest and enjoy views of Black Mountain. After visiting historic Cooktown, travel through the diverse landscapes of cattle stations and the Palmer River gold mine region. Check all of the boxes on must-see attractions in Far North Queensland on this 3-day tour from Cairns. With a small group and a naturalist guide, visit the Atherton Tablelands, Cooktown, and Daintree National Park in a 4WD vehicle. Two nights' accommodation, meals per itinerary, and all transportation included.